LAS VEGAS – Sept. 19, 2016 – Executives with Shelby American Inc., a wholly owned subsidiary of Carroll Shelby International Inc. (CSBI:PK) have announced the return of one of their most popular programs, free shipping, on new orders of a Shelby Super Snake, Shelby 1000, Shelby GTE or Shelby Terlingua. Customers who prefer to transport their car to Las Vegas can substitute a free Katzkin interior upgrade in lieu of the free vehicle transportation offer. The free round-trip transportation offer is for a base vehicle. 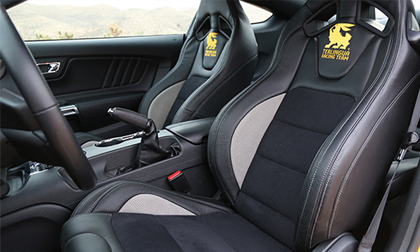 Anyone who wants to turn their 2007-14 Shelby GT500 into a Super Snake or Shelby 1000, or 2015-17 Mustang into a 750+HP Shelby Super Snake, Terlingua or Shelby GTE can choose between the free transportation or Katzkin interior upgrade. While in Las Vegas, each car will receive a serial number for entry into Shelby American’s registry. For those who want to line up their transportation, Shelby American is extending another special offer. Shelby American made arrangements with several transportation companies to ship base Ford Shelby GT500’s and 5.0 Ford Mustang GT’s to the Shelby Las Vegas factory for transformation. Once completed, the Shelbys will be transported by trailer back to their owners. Deposits and base cars must arrive by Nov. 28, 2016, for the offer to be validated. Enthusiasts are encouraged to build their dream Shelby at www.shelby.com. For questions and inquiries on this limited time offer, contact the Shelby American sales department at 844-974-3529 or email sales@shelby.com.